After five years, the northern Sierra Nevadas have finally been moved out of the “severe drought” category by the US Drought monitor following a promisingly rainy start to the 2017 water year. This is not only good news for our agricultural community, but it's also good news for our wetlands, which depend on steady water flow to stay saturated and perform their ecological functions. The gold country region of the Sierra Nevadas has over 1,500 wetlands, which can provide many important benefits including water quality control and purification, runoff reduction, aesthetic value, and wildlife habitat. The Beissinger lab has been working with SFREC and local landowners to study these wetlands since 2002, originally just to track a secretive, understudied bird species: the California Black Rail (Laterallus jamaicensis coturniculus). Our recent research has expanded to study how the wetlands function as a “coupled human and natural system,” affected by both ecological processes (rainfall and natural water flows) and human processes (our irrigation infrastructure and water use). 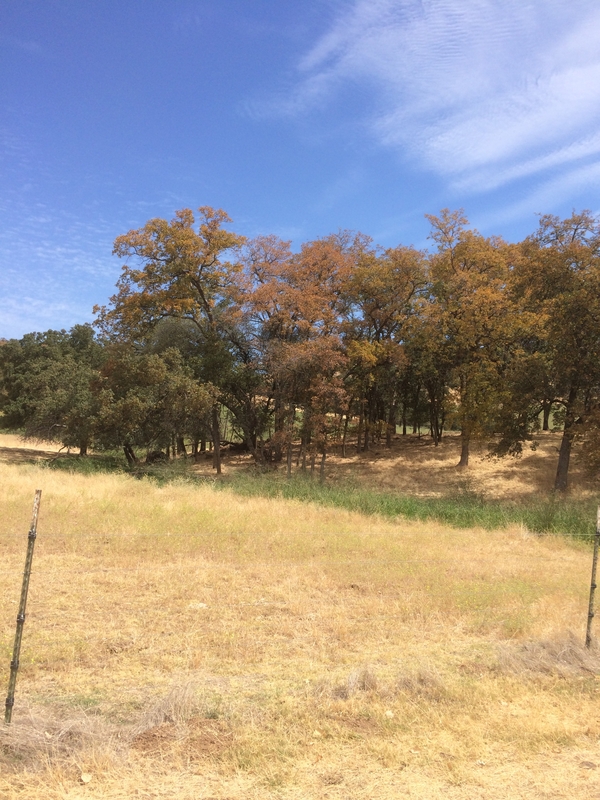 An unintentional wetland created by irrigation runoff at SFREC (left) and an intentionally created irrigated wetland on Spenceville SWA (right). First, we've been tracking how these wetlands changed over time with a time series of historical aerial photographs stretching back to 1947. We first made a comprehensive map of all wetlands in the region, then selected a subset of 283 wetlands and tracked them back through time. Coupled with field visits, seeing what they were like under different historic irrigation regimes allowed us to determine the water sources for each wetland. 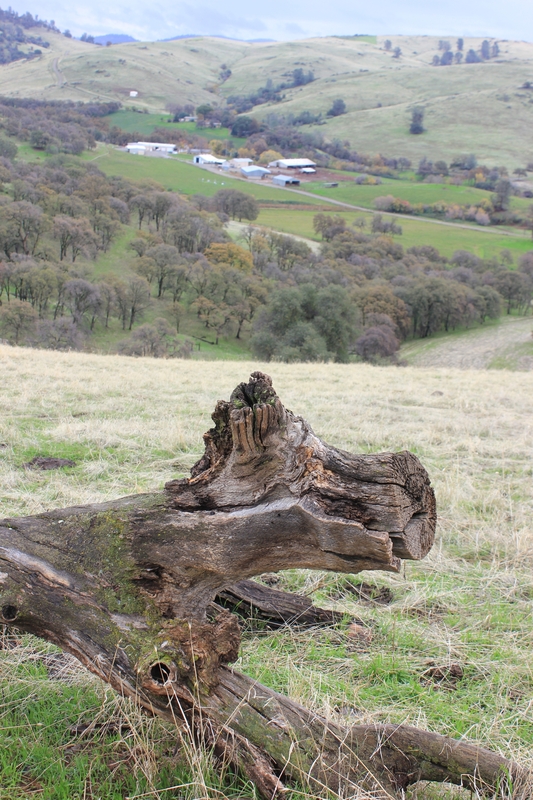 Based on that study, we estimated that nearly 9 in 10 foothill wetlands are fed by irrigation water, and roughly 2 in 3 are entirely irrigation-dependent. Some of those wetlands were intentionally created: state wildlife areas use irrigation to create new wetlands and supplement existing ones, and private landowners on the edge of the Sacramento Valley create wetland impoundments for waterfowl hunting. But over half the irrigated wetlands of the foothills are fed apparently unintentionally by excess water, forming from runoff or leaks from irrigation infrastructure. During times of drought, these wetlands are one of the most vulnerable ecosystems because they are characterized by the presence of relatively small amounts of water saturating the surface. We were interested in figuring out how wetlands fared during the drought, and especially if irrigated wetlands and natural wetlands behaved differently. To determine this, we carried out field visits to 270 wetlands up to 12 times during the 2014 drought. At each visit our technicians walked throughout the wetland with a map and estimated the percent of the wetland surface that was saturated (either surface water or spongy mud). 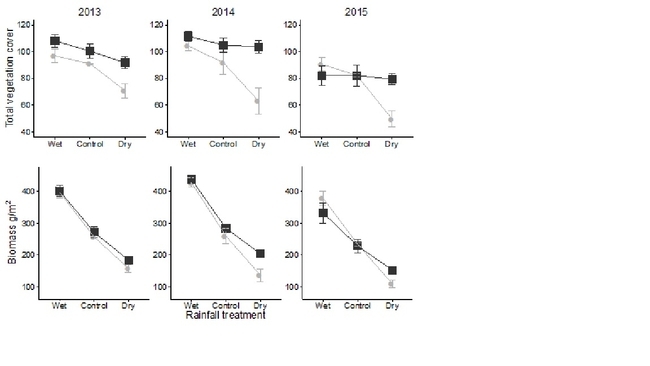 We found that wetlands fed by irrigation water were both wetter on average and more stable over time than natural wetlands during the drought. 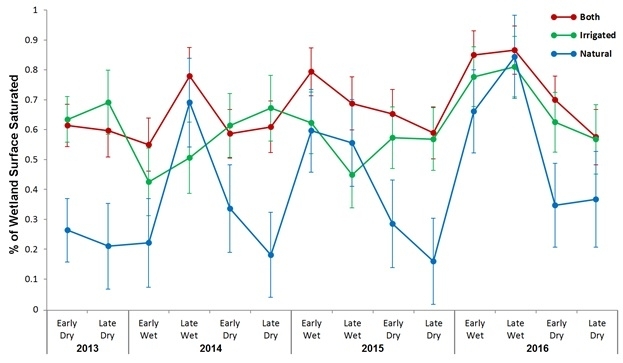 Natural wetlands showed strong fluctuations in saturated area, with over half drying completely at least once during the study period, compared to only a third of irrigation-only sites and only 15% of sites that had both irrigated and natural water sources. 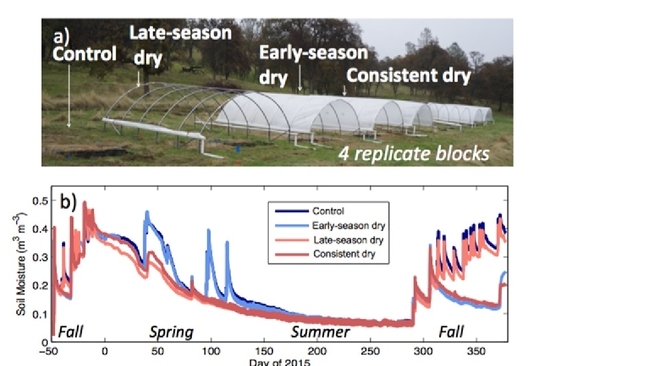 While some drying during the summer dry season is normal, this degree of seasonality was exceptional compared to what our lab had seen in pre-drought years. Mean percent of wetland surface saturated throughout the drought. “Both” means a wetland received both natural and irrigation water inputs. Error bars are 95% confidence intervals. 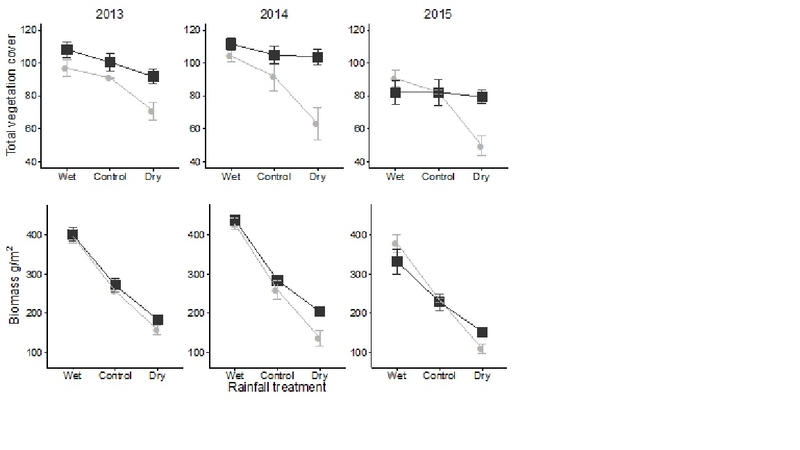 Irrigation water may thus be even more important during drought for wetland species' habitat. Concurrent studies conducted by our lab have found that natural wetlands had very high levels of local extinction for California Black Rails over the course of the drought: no natural wetland occupied by the species in one breeding season remained occupied in the next, and in the last two years of the drought no California Black Rails were detected in any natural wetlands. 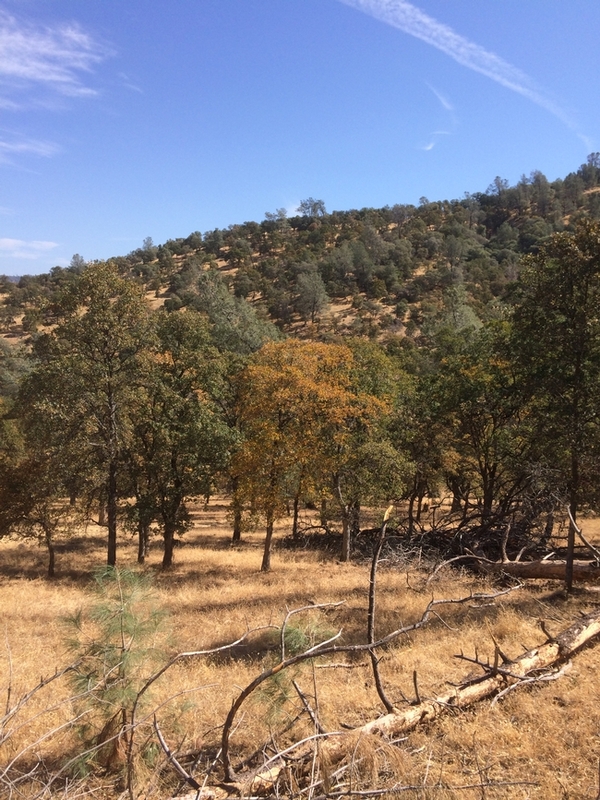 Irrigation water use in the foothills has thus not only dramatically increased the number of wetlands in the foothills, but has increased their function by keeping them saturated year-round. This has created a unique win-win scenario where private, chiefly agricultural water use has created substantial ecosystem benefits. However, this increased resilience to drought could lead to sudden severe impacts if drought becomes any more severe than already seen. 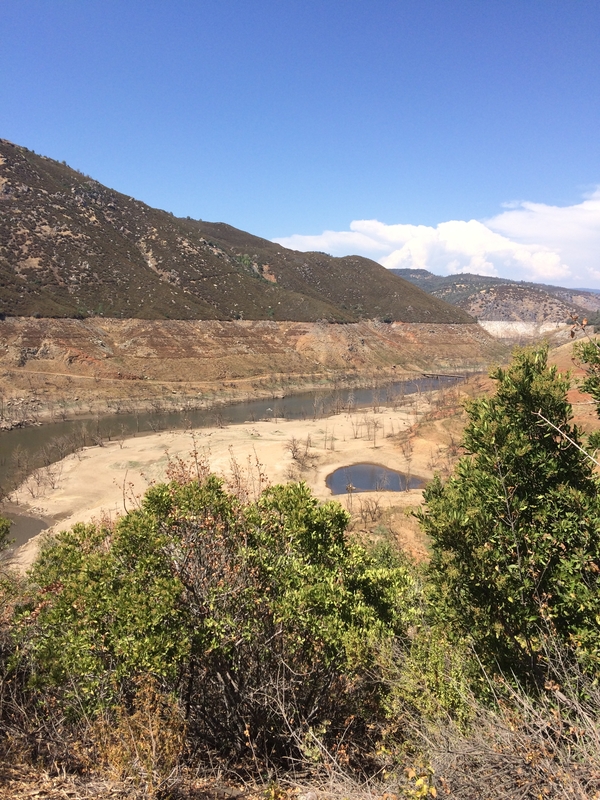 If irrigation water is removed from the wetlands at the same time as natural water—either via cutbacks in response to more severe drought, transferring water out of the foothills, or efforts to fix leaks and reduce runoff—it may create “cliffs” where wildlife populations, bolstered by water sources resilient to mild drought, decline rapidly when faced with sudden reductions in both natural and irrigated water sources. The next step for our lab is to assess whether such dynamics might occur, using computer simulation studies to link the results of our field research together and examine how the system might respond to hypothetical scenarios. 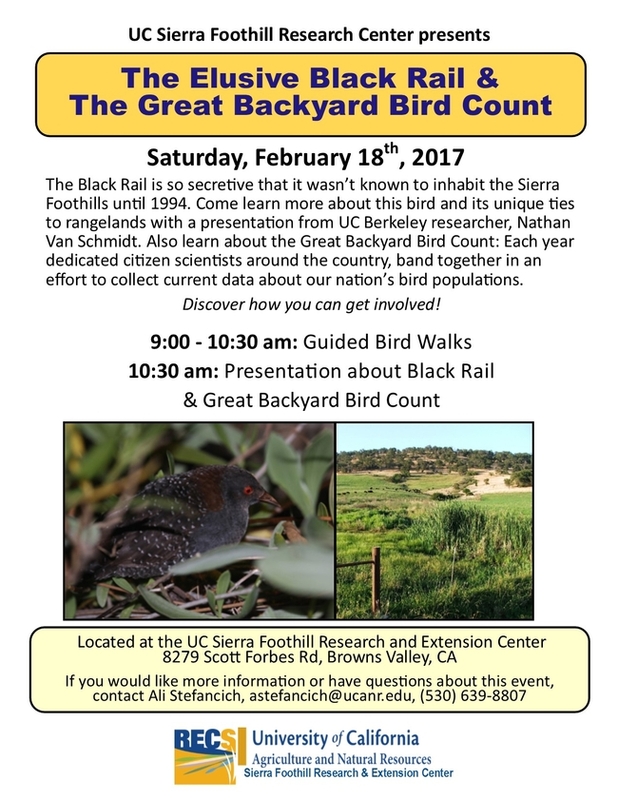 To learn more about the Black Rail, join us on February 18th. SFREC visitors often notice and comment on the large "hoop house" structures that sit in a pasture just North of our headquarters. When precipitation is in the forecast, our staff works closely with the researchers associated with this particular project, to methodically construct the covers on these rain-out shelters in order to meet the specifications of the experimental design. 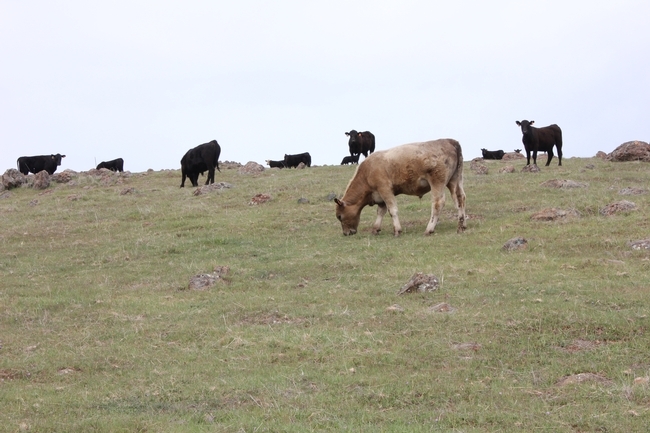 As precipitation more frequently departs from the historical range of variability, maintaining stability in forage production will be a critical management priority in Californian rangelands. 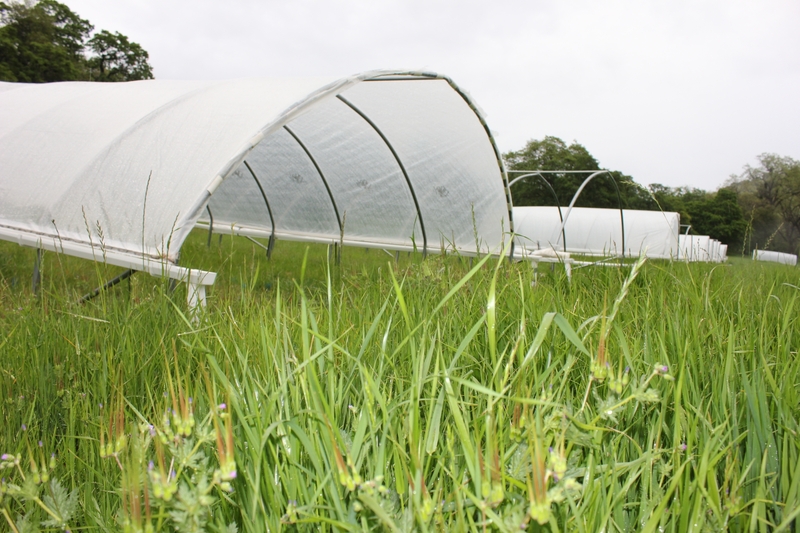 A key mechanism that can lead to stability in forage production is compensatory dynamics, where plant functional groups respond differently to climate fluctuations (e.g.,tap­rooted forbs like Erodium tolerate drought, annual grasses are highly productive in non-drought conditions). Researchers hypothesize that trade-off among functional groups should buffer the response of overall forage production to climate variability and better retain soil nutrients in dry-wet up cycles. 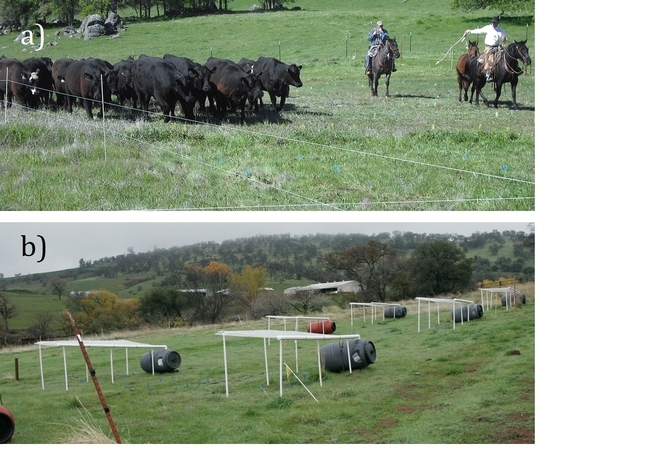 The specific objectives are to: 1) quantify relationships among the fate and retention of nitrogen, soil moisture dynamics, and species compensatory dynamics in drought and non-drought conditions; and 2) incorporate these relationships into process-based models of nitrogen retention and forage production in rangelands. This project will ultimately lead to more informed decision-making for ranchers interested in optimizing forage production and nutrient retention in the face of a highly variable future climate. 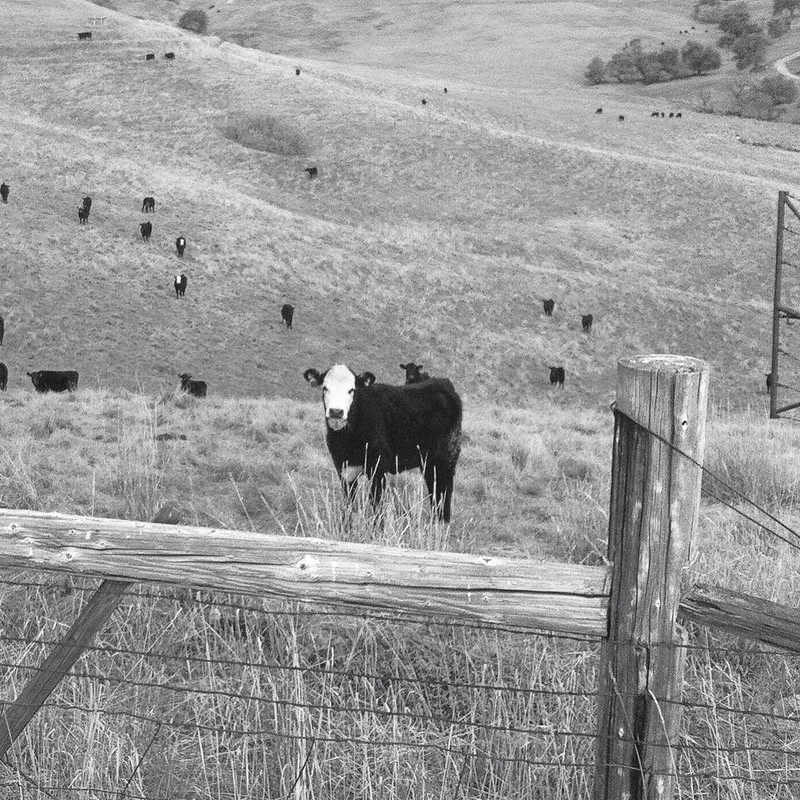 It addresses an often overlooked but critical component to the stability of ecosystem processes: functional diversity of forage groups. Researcher, Lauren Hallet explains the preliminary progress of this project in detail in the below video. Stay tuned for more information as samples are taken this spring.